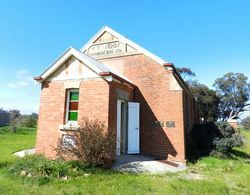 The porch at the Moglonemby Mechanics Institute commemorates those from Moglonemby and District who died in service or were killed in action in World War One. 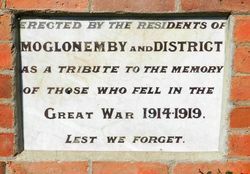 The residents of Moglonemby have decided to erect a porch to their public hall in memory of the fallen soldiers of the district, and to present each returned man with a gold medal. Benalla Standard (Vic), 10 September 1920.